Owning a Car in Korea! 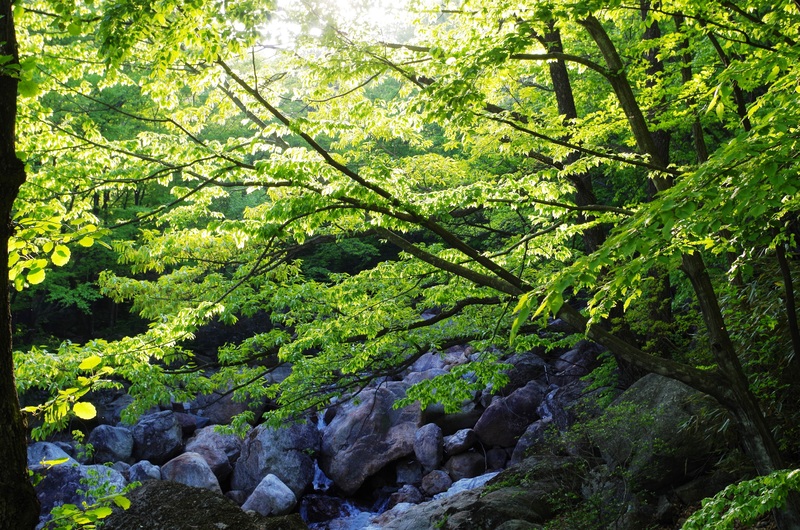 Jirisan National Park is without a doubt the largest and most bio-diverse mountainous national park in South Korea. 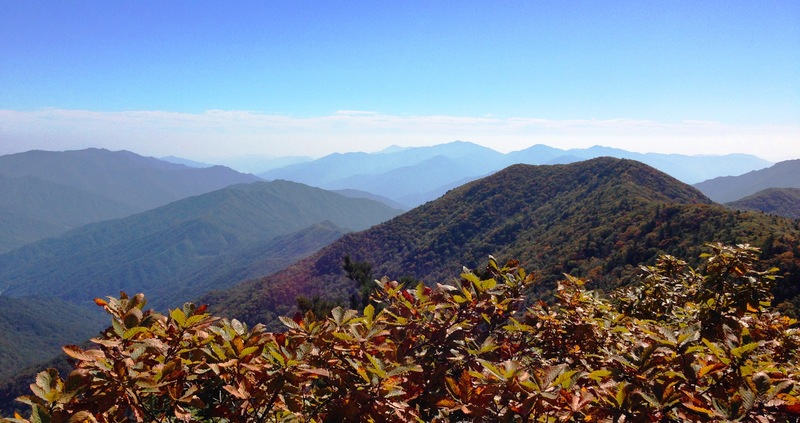 The park is dominated by the highest peak on mainland South Korea (Cheonwangbong Peak – 1915m), but yet there’s a fantastic ridge running east-west throughout the heart of the park that also gets some much deserved attention. 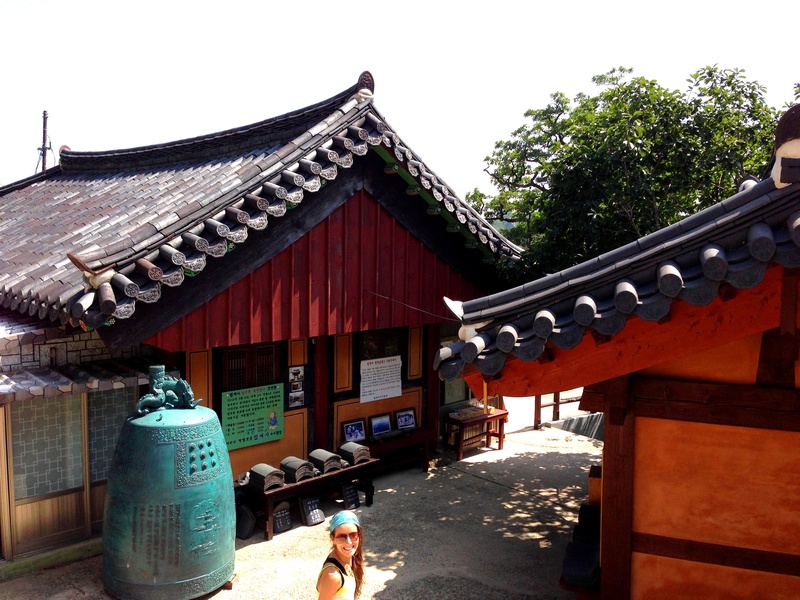 Serious and hobby-hikers alike flock to this park year-round to walk the trails and check out the temples. 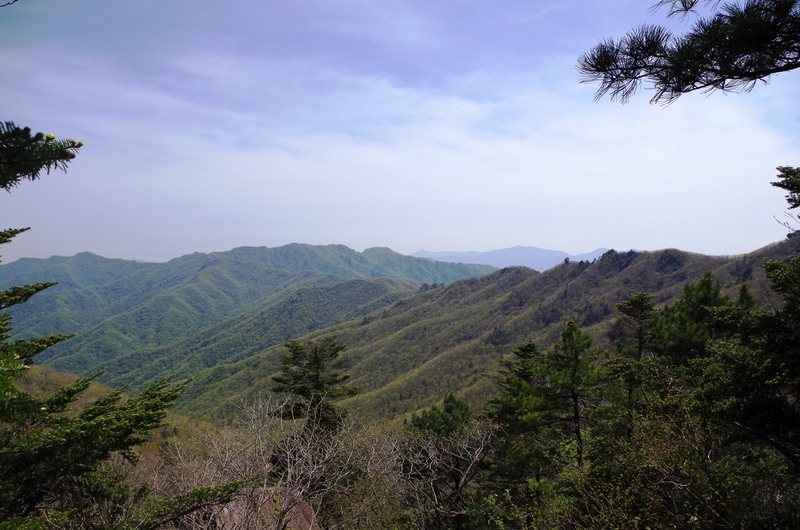 Elicia and I had already visited Jirisan twice: first to summit Cheonwangbong Peak and the other time was to see another prominent peak called Chotdaebong, not far from the previously mentioned peak. The weekend of October 10-12 would be our third visit but most definitely our most memorable because we hiked the entire ridge! This post will provide a summary of what we did, some details of the trail, and the park’s shelters were you can sleep at night. Our journey began Friday October 10 when we finished work at 5pm, put the finishing touches on our packing (we’d be carrying everything for 2 days, so we had to plan and pack carefully!) and got to the Yeosu KTX Train Station for our 6pm train to Gurye, which is very near the southwest corner of Jirisan National Park. We had reserved a motel (using Naver Maps) as close to Hwaeomsa Temple as possible, which would serve as our starting point very early Saturday morning. 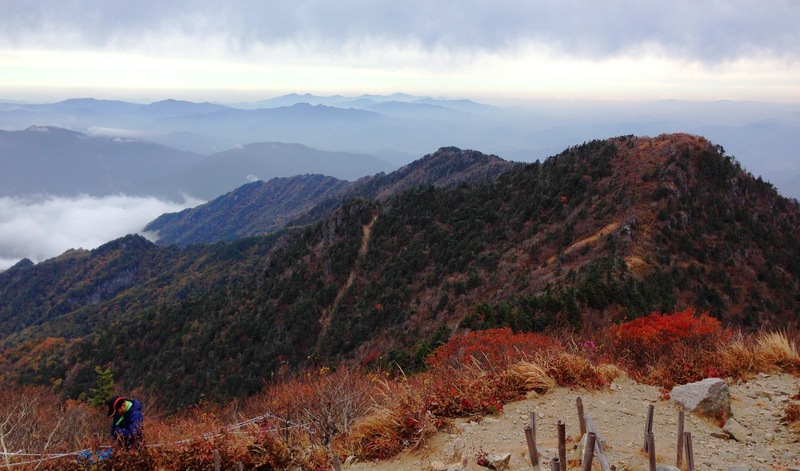 Generally people hike the Jirisan Ridge from west to east, starting at Hwaeomsa Temple in Gurye and finishing at either Jungsanri (we’d finish here) or at either Daewonsa/Naewonsa Temples. 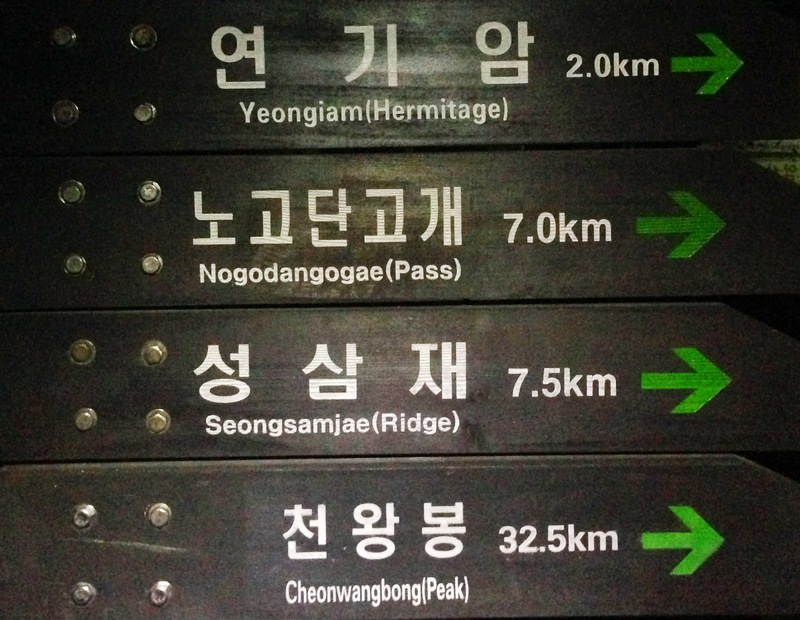 To reduce the elevation gain up to the first peak called Nogodan (near Gurye in the west) you could also also start at Seongsamjae Pass by taking a taxi/bus from Gurye. We wanted the full experience, so we opted against this in favor of walking the whole dang thing. Our goal was to hike the ridge from west to east in two days. Sites generally settle on the fact that three days is the sweet spot, and I’d probably agree. 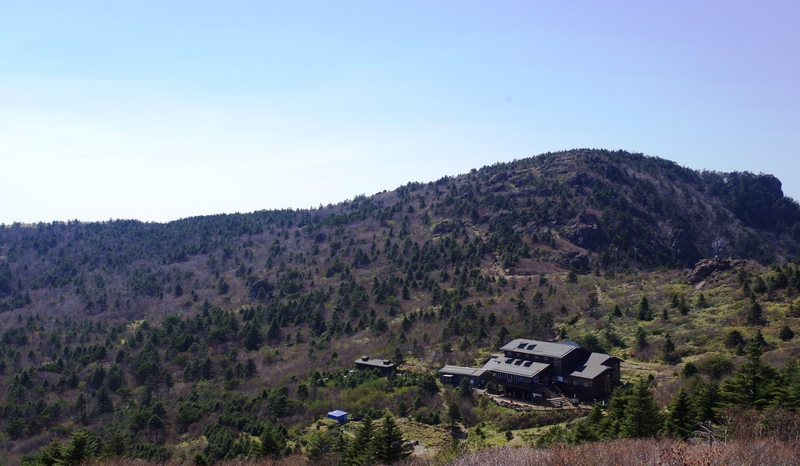 Doing it in two days (one shelter reservation) is possible with 9-11 hours of hiking each day. At a more relaxed pace, three days (and two shelter reservations) would be necessary. 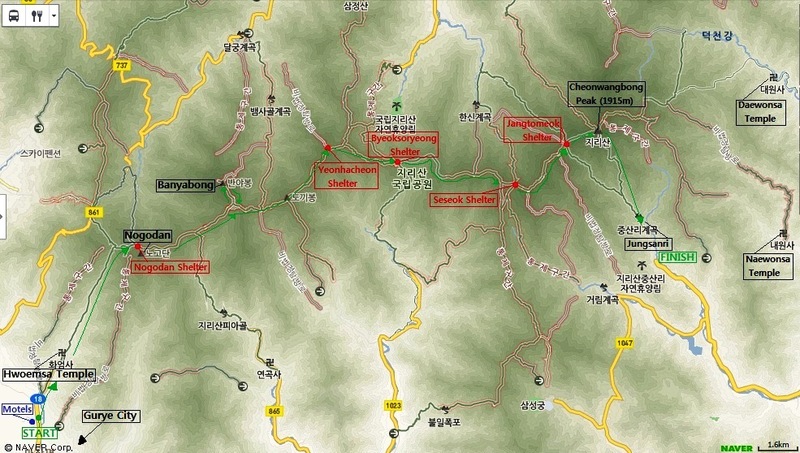 Check out this map below (click to enlarge) – it has the main points of interest for the Jirisan Ridge hike: temples, five of the shelters (there’s a couple more but not on the main ridge-trail) and some noteworthy peaks. After visiting with our friends in Gurye on Friday night our heads hit the pillow at a decent hour, but our alarms awoke us from the quiet darkness at 4:30am. We were out the door of our motel by 5:00am and walked the 3km up the road, past the car parking, through the park entrance, and arrived at Hwaeomsa Temple at 5:45am. Things were still dark as the sun didn’t rise until about 6:15am. Technically the national parks are open from two hours before sunrise until the sunset. There are also checkpoints along the ridge where park rangers won’t let you continue if your destination is too far for the time remaining in the day (things start to close down in the late afternoon). Hence, we started at o’-dark thirty in the morning to avoid all these potential hiccups. Walking with just the headlamps for the first hour was actually enjoyable – adrenaline, excitement and anticipation for an epic weekend kept our legs moving nicely. 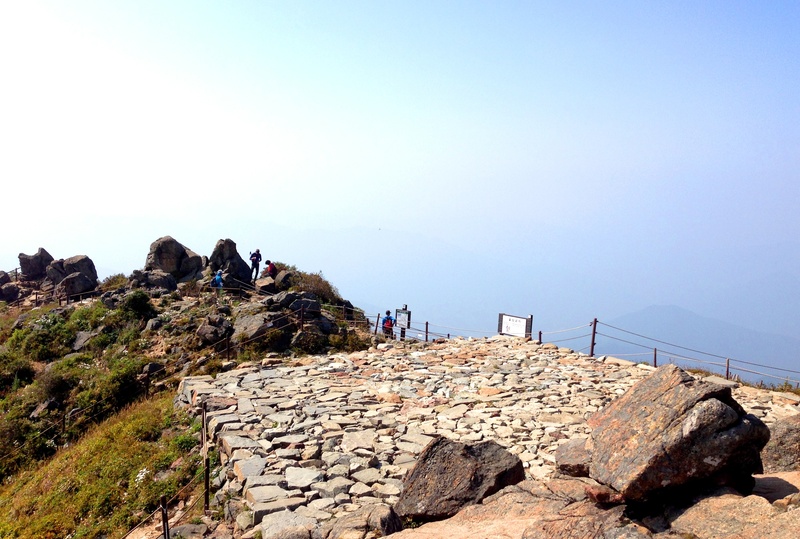 From Hwaeomsa Temple, as the sign above suggests, it’s 32.5km to the 1915m Cheonwangbong Peak. First it’s a 7.0km hike up to Nogodan Pass, which took us 3.5 hours to do while maintaining a sustainable but reasonably quick pace. Starting at a mere 200m or so and ascending up to 1450m is no easy task, but because the trail is long it means it’s never impossibly steep. A delicious PBJ sandwich and fruit served as breakfast and we were carrying a wide assortment of other fruits/veggies/snacks/meals. We didn’t want to kill ourselves on the first climb as we knew there’d be a gazillion more ups and downs in the coming 2 days of hiking. 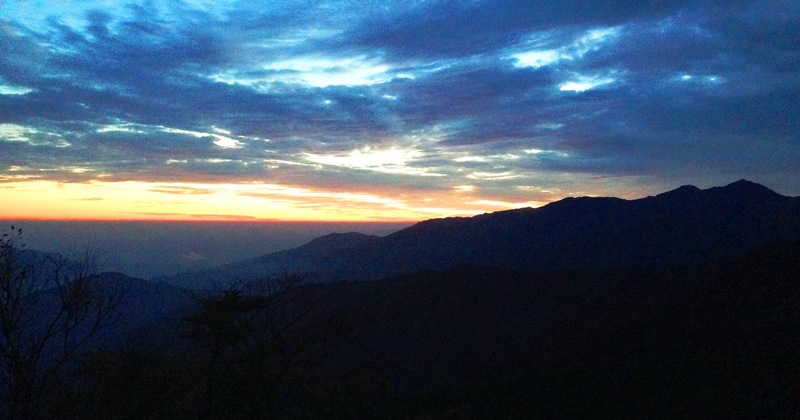 Once the sun came up and we neared Nogodan, we realized it was going to be a superb day for hiking the ridge. The foliage was still green down at 200-400m but up around 1200-1400m at Nogodan the autumn colors were starting to look superb. We merged with a bunch of hikers who began at Seongsamjae Pass, they were still chatting and laughing with their fresh legs, meanwhile Elicia and I had already been going for 3.5 hours and had climbed ~1200m in elevation! We weren’t one bit jealous of their short-cuts, we enjoyed the climb up to Nogodan and would recommend starting at Hwaeomsa Temple for sure. 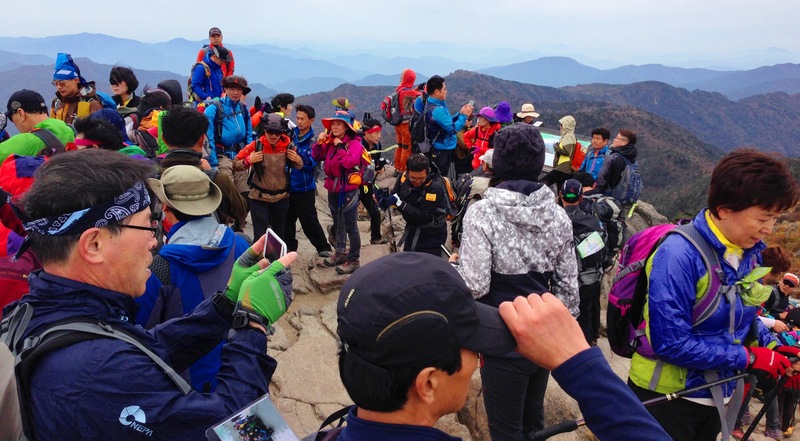 Now being about 9:30am, we opted against climbing the stairs to Nogodan Peak because we would have had to wait for more people to join us – apparently a group of 10-12 people is led by a park guide who takes you to the top. Round trip it’s only 20-30 minutes I think but we decided to skip it because we’d be hiking all day and it’s a lesser-peak within Jirisan National Park. No regrets! A quick note about our gear: It was autumn so we each brought a couple of layers. Elicia carried a 28L backpack and I brought along a 50L pack. There’s places to fill up with water along the way, but definitely start with water and plan on bringing 2L per person as there’s some long stretches without water. We brought a little propane burner and pot to boil water and cook some meals (ramen, rice meals, etc) and plenty of food for snacking along the way. We also brought our amazingly awesome Kovea inflatable sleeping pads which pack down to a tiny size and are only 500g each. Our goal was to pack light, wear layers so we could be best prepared for a range of temperatures and conditions, and keep moving with minimal breaks. 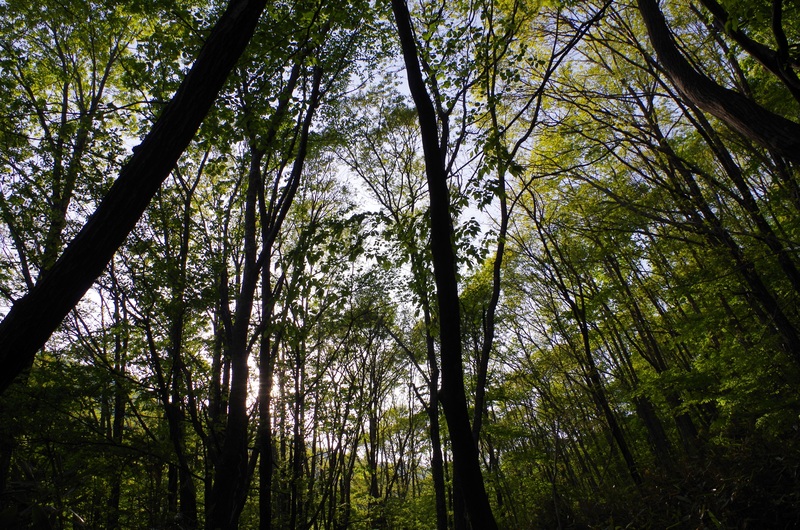 Much of the hiking on Saturday looked like this in the above picture: tree-lined trails of small rocks. There were rarely big boulders to climb around, and the trail along the ridge was generally pretty flat. Sure, it was an undulating terrain but you rarely were asked to climb up for more than 10 minutes, nor were you descending for more than a few minutes. Up and down, up and down. It really made for an enjoyable hike! 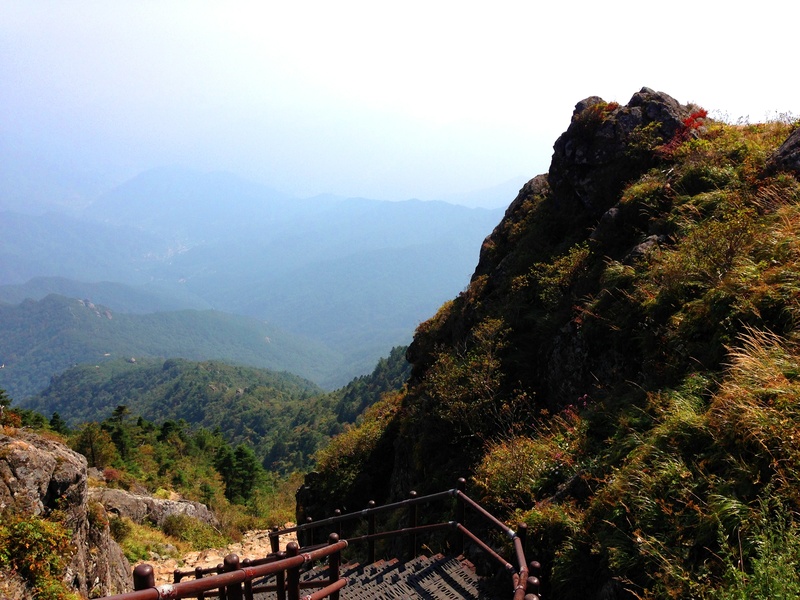 Like bugs to the zapper, we are drawn towards those highest peaks in Korea. We made the summit and enjoyed it for awhile along with a whopping total of five other people! In total it was a little over an hour side-trip, but one I’d highly recommend if you have the time for it. 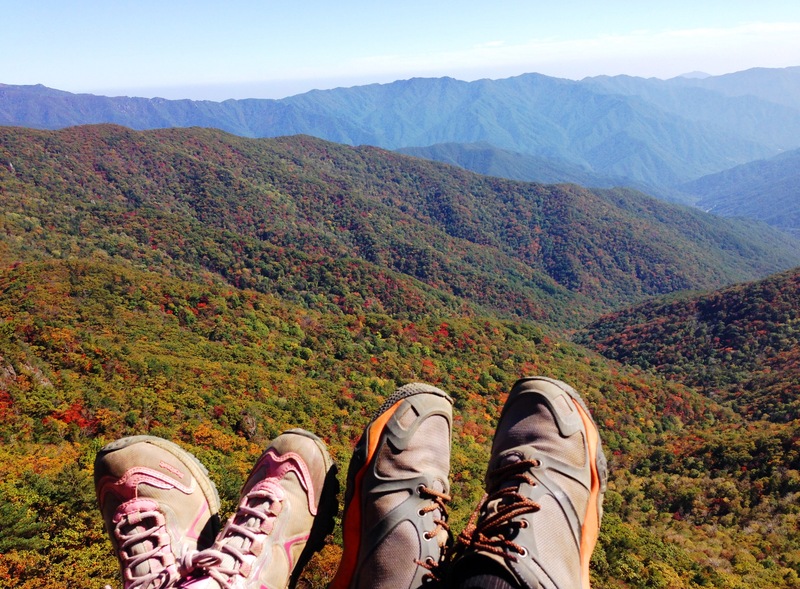 In my opinion it would have been difficult to skip Banyabong Peak because it’s the 6th highest peak in South Korea! It was a must-see for us. After coming back down we grabbed our packs and settled in for some lunch. This was our longest break and it maybe lasted 20 minutes or so. Tuna, rice, crackers, fruit, and dessert provided some much-needed calories and energy, we’d already been hiking for approximately seven hours! After lunch we continued heading east along the ridge. 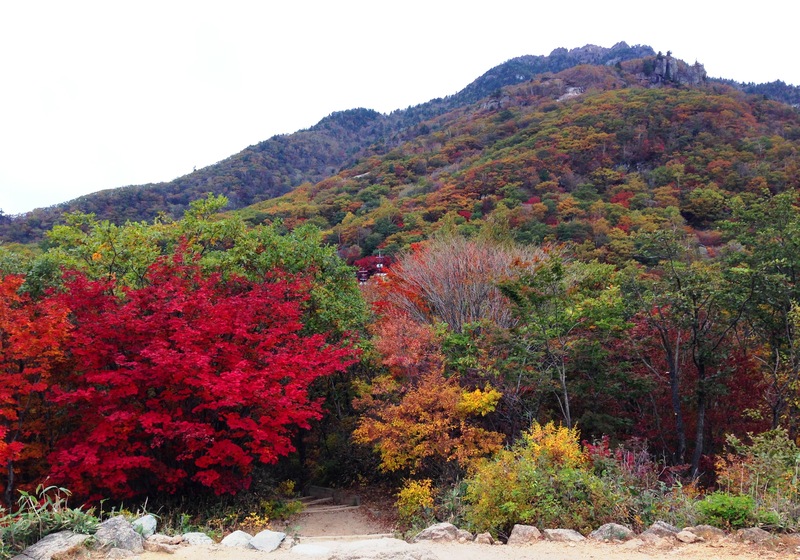 There really wasn’t too many people considering it was a Saturday nearing the peak autumn season. The amazing views of the ridge continued. After cruising on the trail for a bit more our legs began to feel the effects of being on our feet since 5am without any real rests. Although we didn’t have time to completely chill out and regain energy, we couldn’t help but put up our feet at this spot and enjoy the valleys. After a brief breather we yet again continued on along the trail. Prior to hiking I was wondering how the signage would be since there’s so many forks in the trail and different ways to go. It turns out there’s only one way along the ridge, and all the signs point to Cheonwangbong Peak, so it’s actually super easy to follow along. The high afternoon sun was beginning to dip below the mountain tops, and we were nearing our destination for Saturday night: Yeonhacheon Shelter. It’s important to make a reservation ahead of time from this site, but it’s all in Korean and unfortunately this is the only way to make a reservation. There’s limited space at the shelters and simply showing up is not a viable option unless it’s an extreme emergency. We made the reservation about three weeks beforehand because things fill up real quickly. 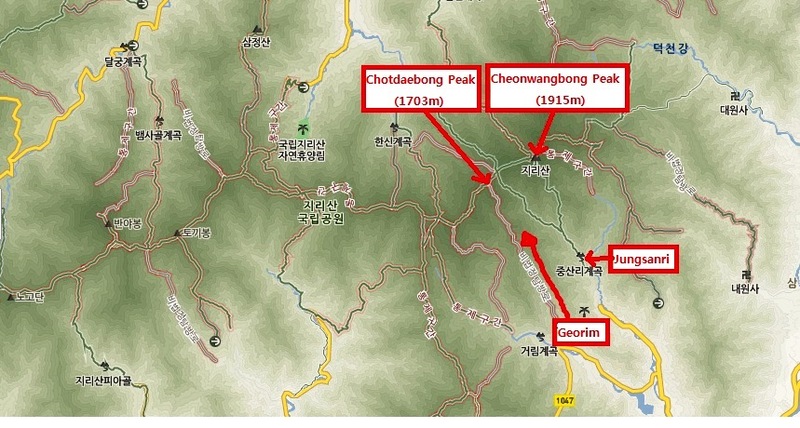 In terms of logistics, Yeonhacheon Shelter isn’t quite at the halfway point to Cheonwangbong Peak if starting at Hwaeomsa Temple. Unfortunately it was the only shelter with availability when I made the reservation, so our hands were tied, and we’d make due with a little longer day two. After all, we wouldn’t have all that vertical gain on the second day, it’d just be the undulating terrain of the ridge and a long descent after Cheonwangbong Peak, so theoretically it’d be an easier distance to cover. After indulging on all sorts of high-calorie foods for dinner (the shelters have a few snacks available for purchase, but don’t plan on getting your dinner/breakfast there), the sun was gone and the crisp air chased us right into the shelter for the evening. Men and women are separated into different rooms, and you’re given a number to indicate your space in the sleeping quarters. It’s not too spacious, but it’s adequate. We turned in pretty early to help recover from hiking and to also prepare as best as possible for Sunday’s finishing stretch. I’d love to write that we both slept well, but unfortunately the near-capacity crowd of hikers coming in and out, snoring, and talking until at least midnight made for some sleepless “rest”, even with headphones and soft music playing. It was good to get the legs up and recover a bit, even if we couldn’t sleep as much as we both had envisioned. Needless to say, the 4:30am alarm we agreed on waking up to seemed like an impossible task, but somehow we both peeled ourselves off our sleeping mats, packed up our gear, used the toilet, and hit the pitch-black trail by 5:00am. Once again, our headlights illuminating the path ahead. Giddy with some new-found energy and excitement, we both trotted onward in the peaceful quietness, absorbing the beauty of the trail and surroundings slowly coming alive in tandem with the rising sun. 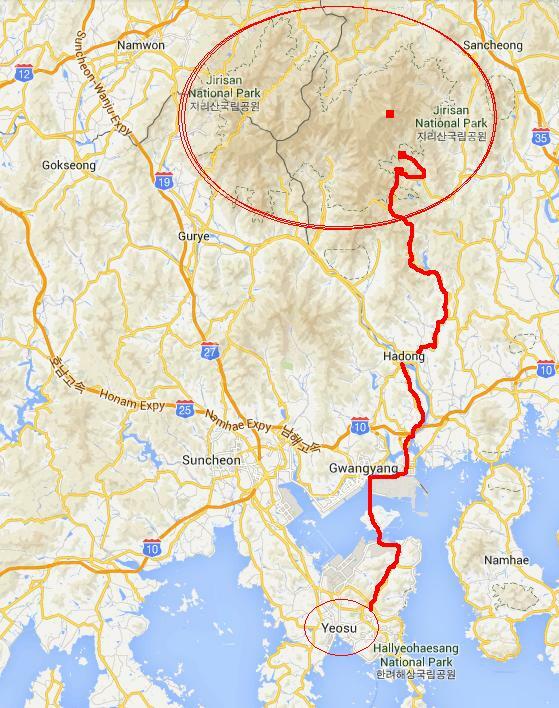 We made quick work of the 3.3km segment between Yeonhacheon Shelter and the next (much larger!) shelter called Byeoksoryeong. It was here we filled up our water bottles (and large 2L back-up) and also heated up some water for a fancy breakfast that included some rice/noodles, fruit, and trail mix. Oh, and two cups of coffee for each of us! Leaving Byeoksoryeong Shelter (pictured above) after our longish breakfast break we observed that the sky was a bit overcast, it was cooler outside than Saturday, and certainly more windy. The warm breakfast helped revive our spirits and prepare us for the nitty gritty work that lay ahead. 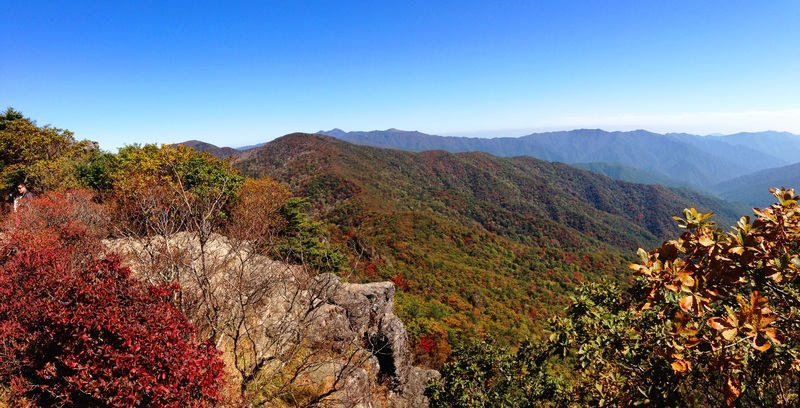 Despite the overcast conditions, the views along the ridge continued to be splendid, and the autumn foliage was easily visible as we scooted westward along the ridge. 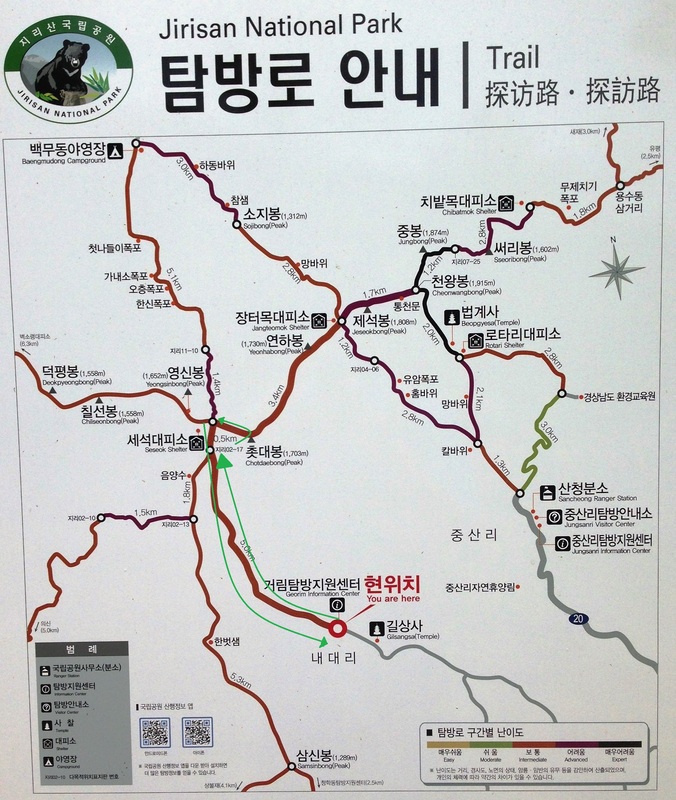 The trail measures 5.5km from Byeoksoryeong Shelter to Seseok Shelter, which is the next main resting spot along the ridge. During this stretch, there were several ups and downs that included great lookouts in every direction. 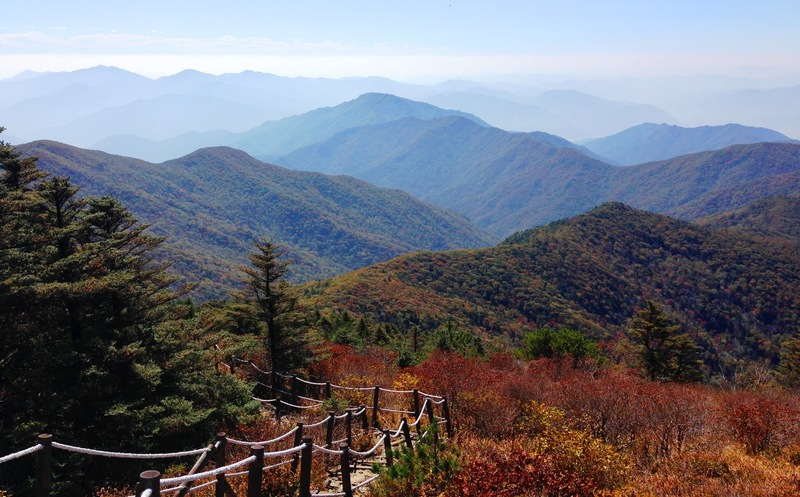 In the picture below, you can see the tallest peak slightly to the left, Cheonwangbong, standing tall at its 1915m. That’s where we’d be heading today! We were in good spirits and continuing to move surprisingly well! As fun as it was to look ahead and see Cheonwangbong Peak, it was neat to look back and see some peaks where we had come from. It had been quite the journey to get to this point, and the hours (and km’s) seemed to tick by with ease so long as we didn’t forget to take short breaks and eat our snacks! We summited Yeongshinbong Peak (1651m, #10 highest peak in Korea) before descending back down a little bit to the next shelter, Seseok. Continuing to head eastward along the ridge it’s a long and steady climb from Seseok Shelter up to Chotdaebong Peak. 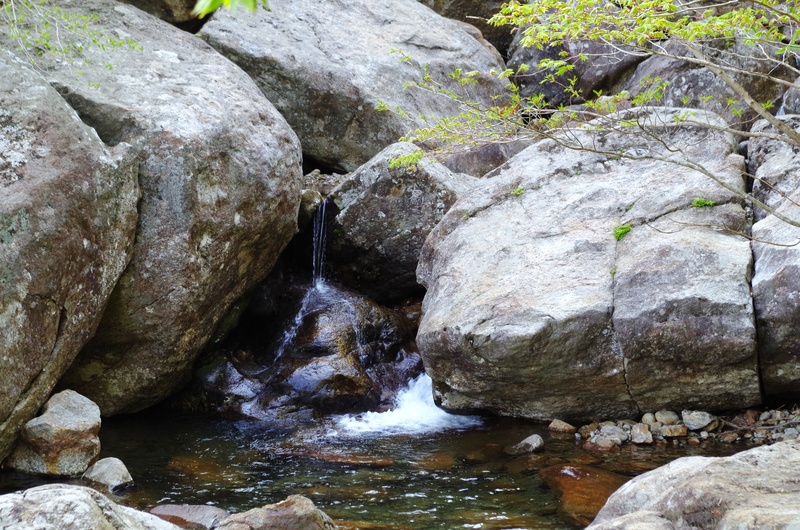 We had been to Chotdaebong earlier in 2014 along with our friend Ian (that post is here). 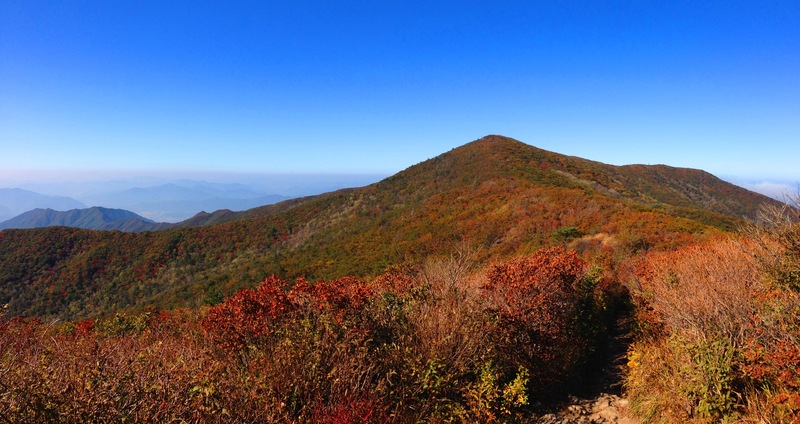 Chotdaebong is relatively significant, it measures 1703m and is the eighth highest peak in Korea. The 0.6km stairmaster-like ascent from Seseok didn’t take too long, but our bursts of good efforts started to become shorter and shorter. We took a short break to enjoy the views, but the cold, gusty wind chased us off this exposed peak pretty quickly. We couldn’t help but notice how close we were to Cheonwangbong now… it was just after 11am and we gained some confidence that we could finish this buggar! Starting early in the morning really paid off. 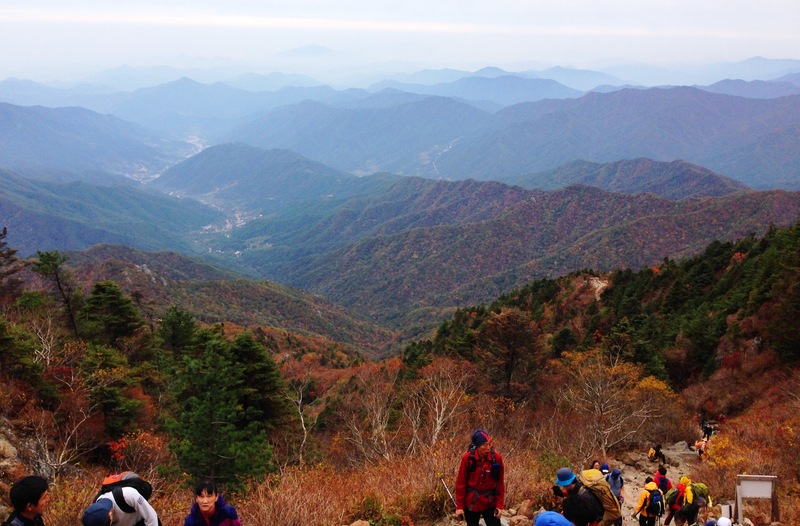 Here’s a picture taken from Chotdaebong Peak, showing the ridge and trail up to Cheongwangbong in the distance. Looking left (north) there were some cool low-lying clouds taking refuge in the rippled mountains. From Chotdaebong it’s 2.1km and about 45 minutes of a down, down, down, and an up, up, up to Yeonhabong Peak. In this picture below you can see Yeonhabong (1667m, #9 highest peak) in the foreground with Cheonwangbong Peak looming in the not-too-far off distance. Despite our tired legs and minds, we continued to soak up the views. We were getting spoiled by the contstant views the ridge provided. The end was in sight, it was in our grasps! 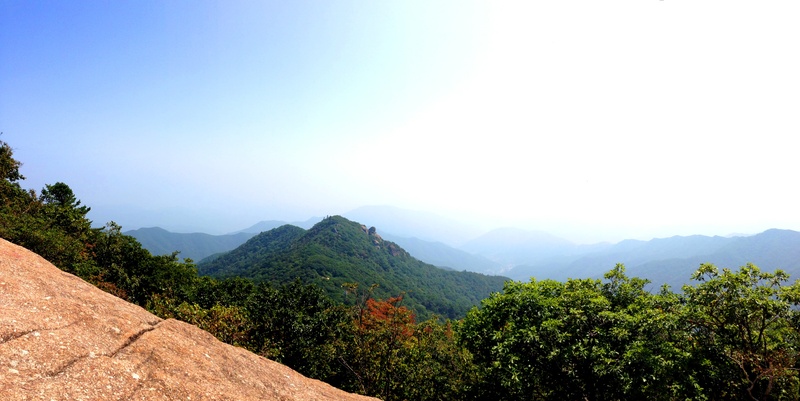 Just one final 1.6km push up to the peak of all peaks, Cheonwangbong. 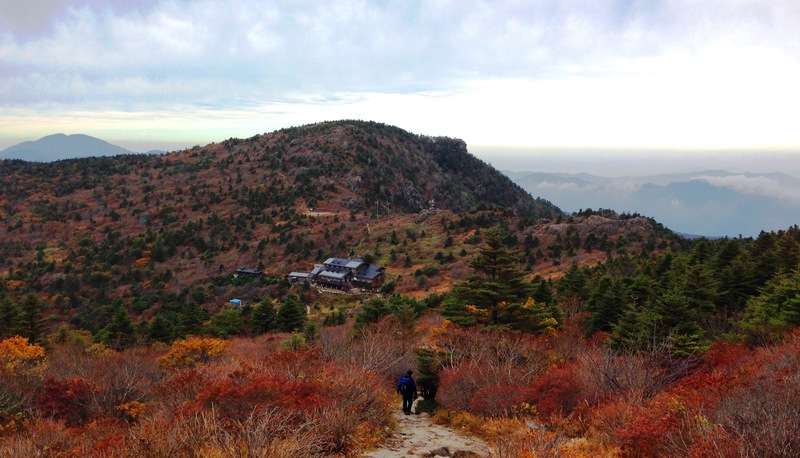 We encountered lots of traffic on this section of trail because it’s a super popular option to loop Jangteomok Shelter either before or after summiting Cheonwangbong Peak (one-day hike). 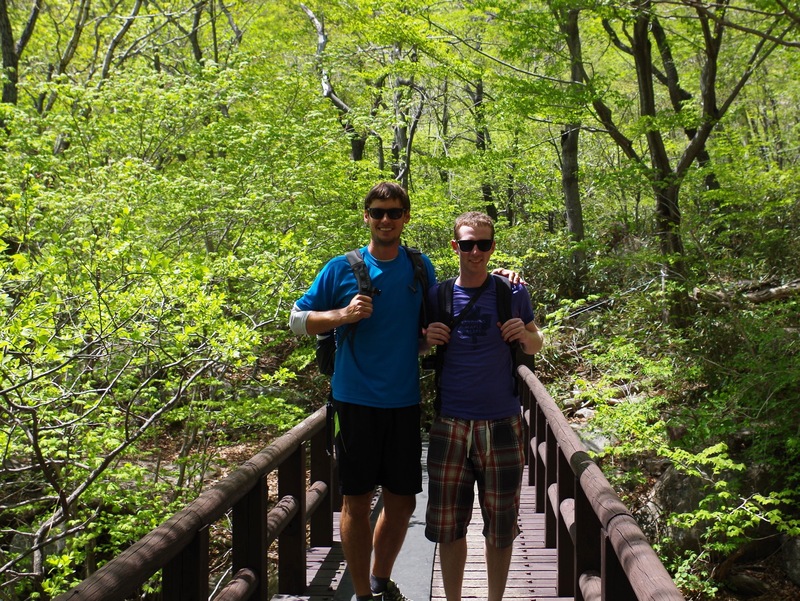 Heck, we did it our very first trip to Jirisan back in 2013 and loved it. Today, the feelings were different as this marked the end of a long journey eastward across the entire ridge. so we opted to take refuge down the backside of the peak, away from the wind. We settled in and ate just about all the food we had left in our backbacks. The celebratory Pepsi gave us some much needed sugar, and we found ourselves just reminiscing about the 32.5km journey that started Saturday morning at 4:30am in the motel near Hwaeomsa Temple in Gurye. Boy, how far we had come, and what a sense of a relief it was to think we didn’t have to hike up stairs anymore! It would be all downhill from here back to civilization! We scooted down the mountain in a faster-than-average pace and made it to the bus stop in one piece! Over 40km of hiking over 21 hours… done! We grabbed a local bus that took us from Jungsangri village to Jinju, where we transferred and caught a bus to Suncheon, where we yet again transferred and caught a bus to Yeosu. It was a whirlwind of two days spent walking and eating without much sleep. This ridge is pretty remarkable in that you never dip much below 1400m, so you’re constantly up in elevation, getting treated to views of the surrounding peaks and valleys. If I had to narrow down my advice for this ridge to three things, they’d be: book a shelter far in advance, start very early each morning, and bring plenty of food/snacks/money! 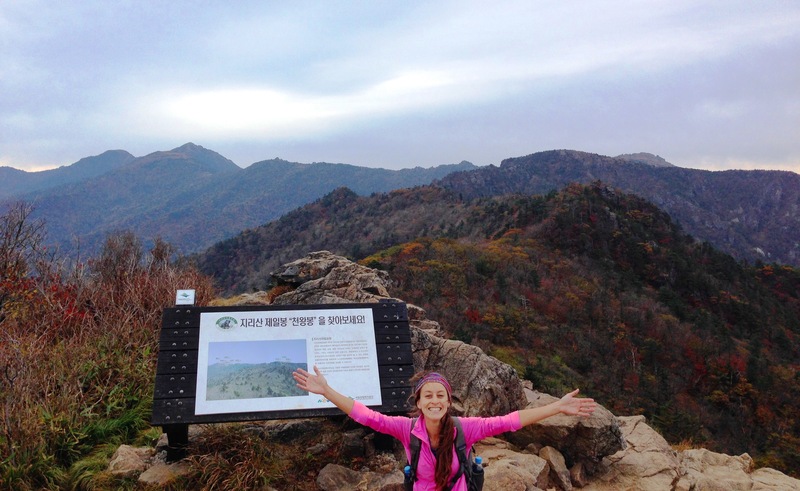 This weekend of the Jirisan ridge will be one I’ll forever look back upon and wonder, “gee whiz, how’d we do that?! ?” Sure, it’s a lot of hiking and physically challenging, but if you start super early, bring plenty of food, stay hydrated, and bring the right layers of clothes, you can walk your way across this ridge just like we did! 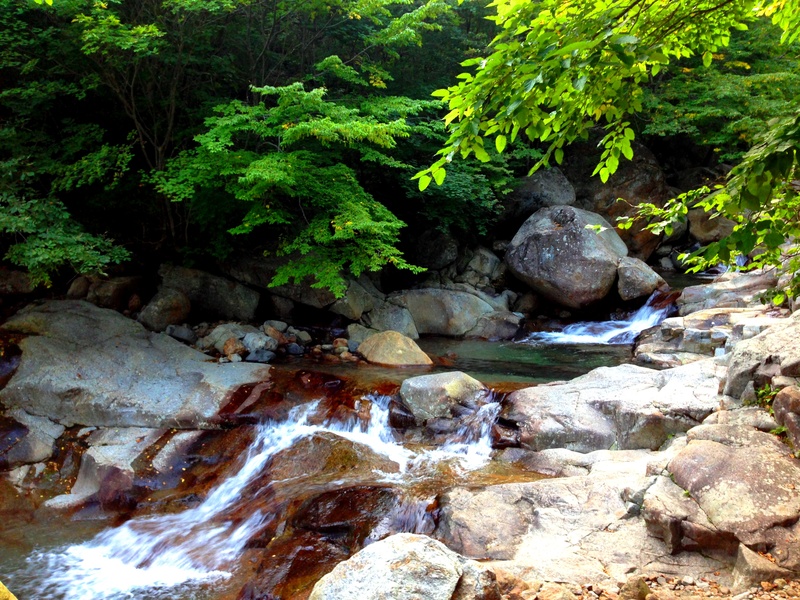 Thank you, Jirisan National Park. You are huge and awesome! 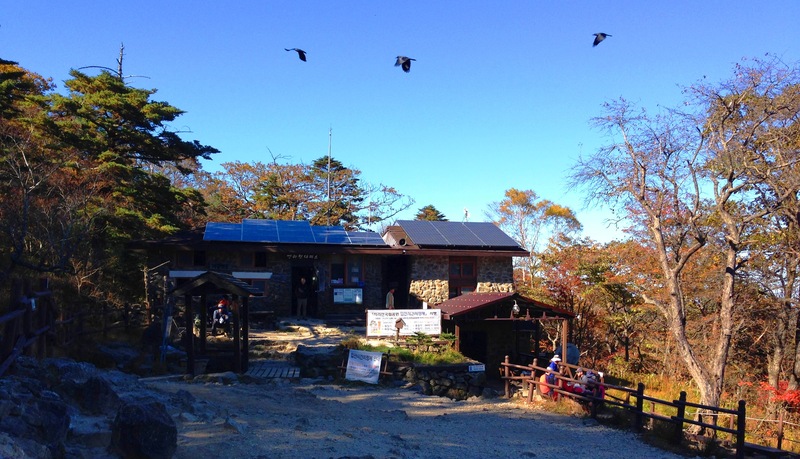 What: Georim (거림) is an information center and trail-head in the southeastern part of Jirisan National Park. 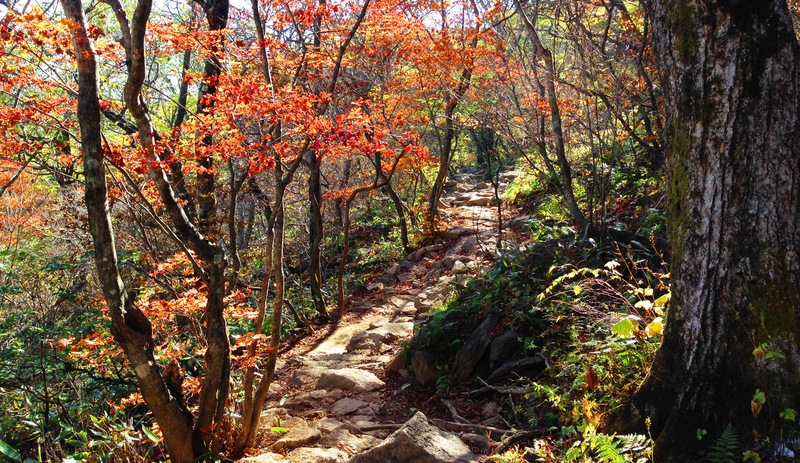 The main trail from the Georim area follows a mountainous stream for a while, heading up past Seseok Shelter (세석) which is right next to the 1703m Chotdaebong Peak (촛대봉). 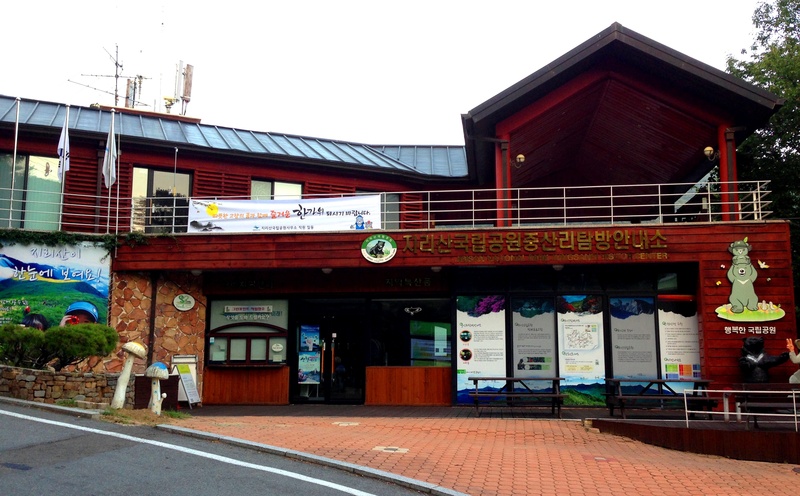 Elevation: Chotdaebong (촛대봉) is 1703m, ranking 8th on the list. Getting There: I’m not 100% certain, but I am assuming there aren’t any buses that regularly run to this Georim area, so accessing this trail-head without a car or long taxi ride might prove to be a little difficult… We drove our trusty ’97 and were able to park at the free parking lot for the day, no trouble. Hiking Highlights: Our friend Ian joined us on this hike. We set out around noon because we a) drove from Yeosu b) went to Jungsanri to set up camp and c) drove back to Georim area. We wanted to see some new terrain and trails, so with our backpacks full of water and food, we began heading up. 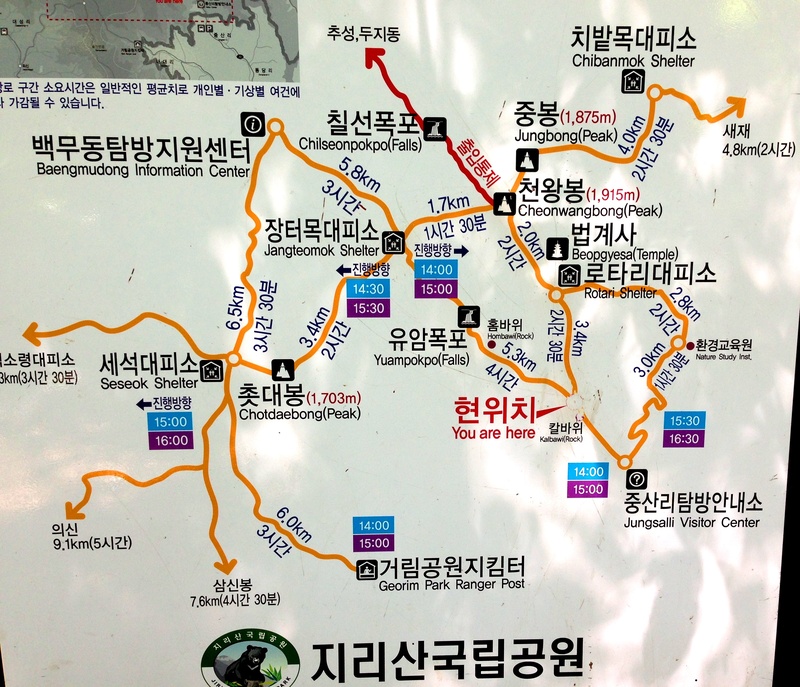 As you can see in the above trail map, we had a 5.0km trail to Seseok Shelter (where you can sleep if you reserve ahead of time) and then just another 0.5km to the right (east) to Chotdaebong Peak. We’d plan for an out-and-back because unfortunately there wasn’t a way to make a loop with the available trails. The trail was beautiful. 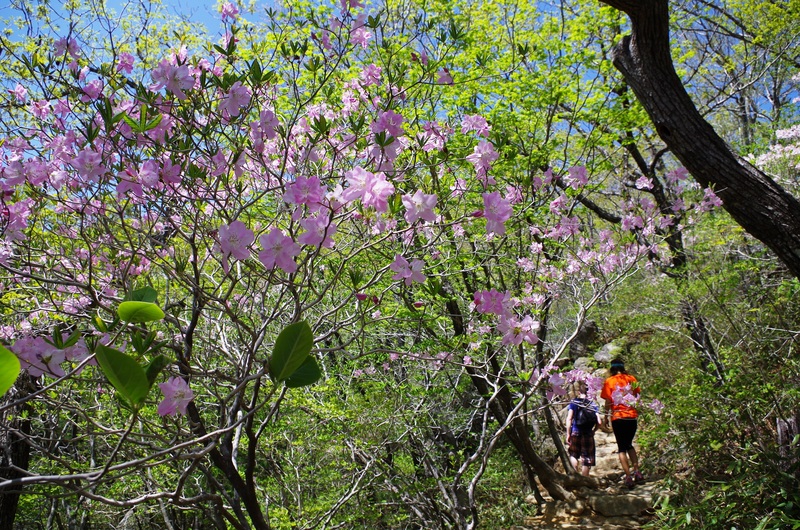 We hiked this back in May so the blossoms were still out and the birds were making music. The trail follows a mountain stream for the first 2km or so, and it was fun to listen to the water as we trotted along. 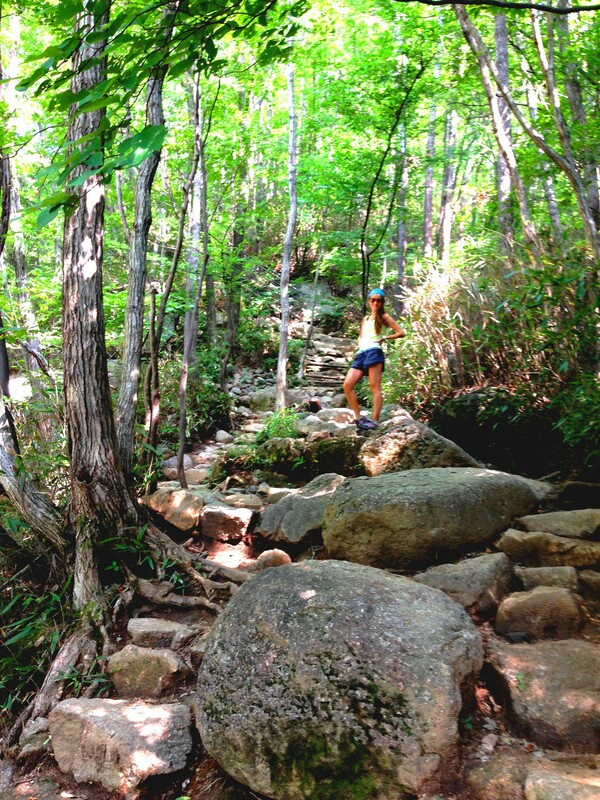 But otherwise, it was pretty easy going and fairly relaxing (unlike some trails where it’s a stair-master for 3 hours). 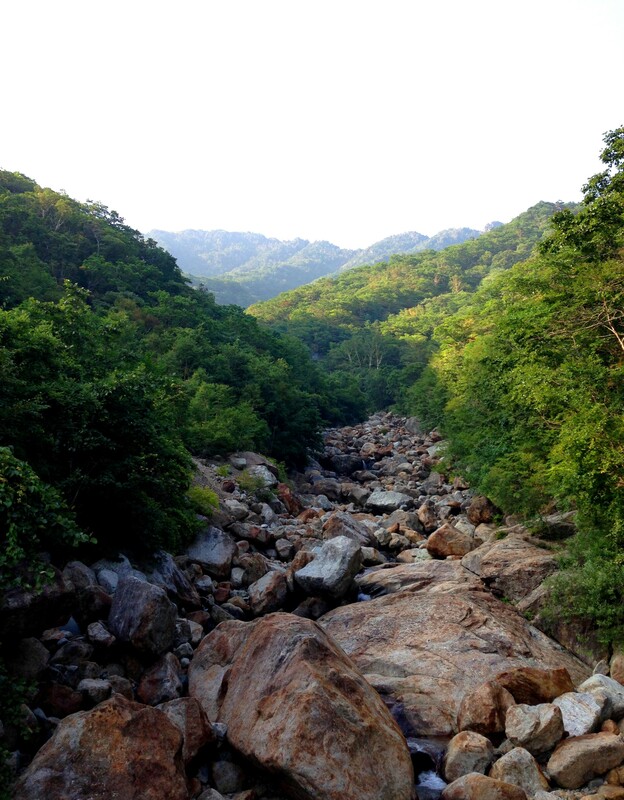 I love when the air is clean and you can see for long distances… the Korean mountain ranges have so many ripples. I think they’re pretty neat. 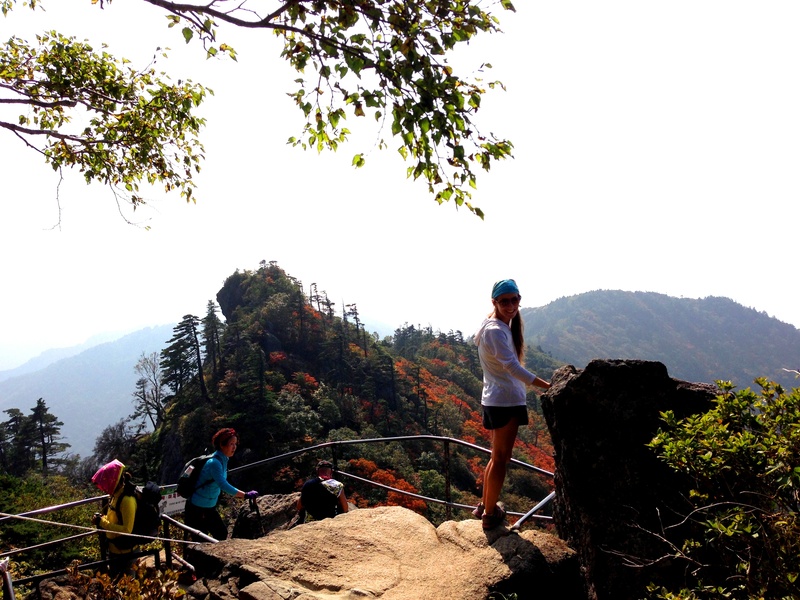 We made that right-hand turn to finish the 0.5km to the goal, Chotdaebong Peak. There we some hikers with large packs, they were likely hiking a good portion of the ridge or the entire ridge during the weekend, making stops at one of the shelters at night for food and sleep. The three of us hung out on Chotdaebong for a few minutes. The sun was warm, but the wind was a bit chilly. We snacked and made friends with some Koreans (love it!). 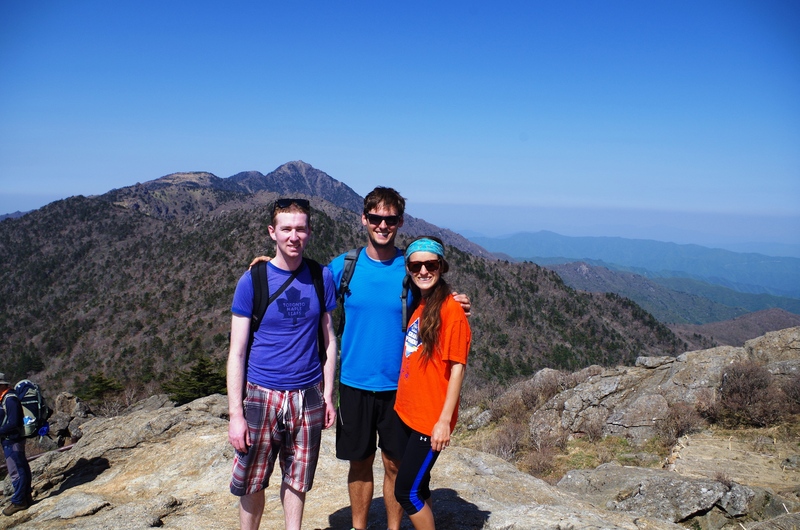 Standing atop Chotdaebong was a pretty good feeling, and I’m sure Ian and Elicia would agree. We were up there. 1703m to be exact. 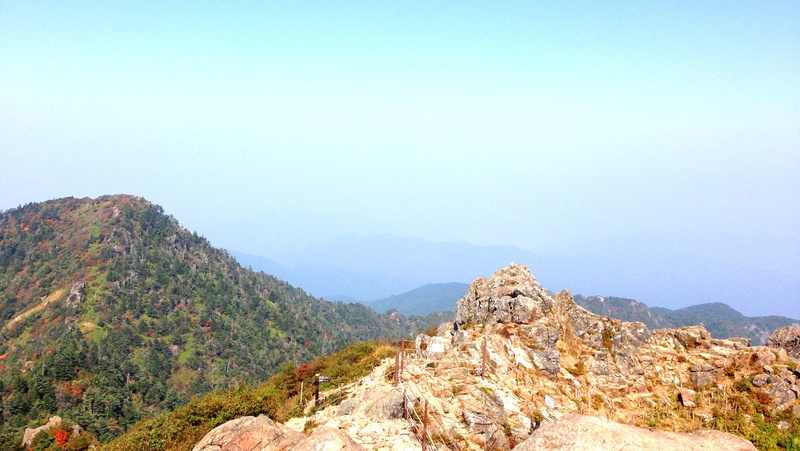 Just across the ridge (and behind us in the above picture) stood Cheonwangbong Peak (1915m). 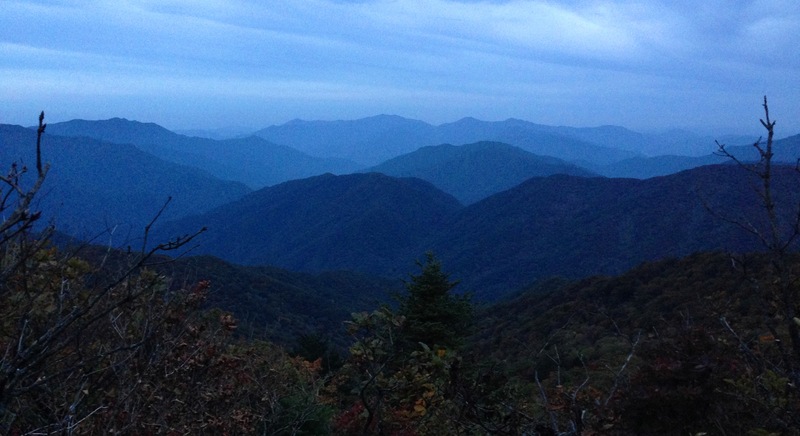 We headed back towards Seseok Shelter, then took a left hand turn down the trail we had just gone up. Just like on the way up, we enjoyed some good conversation. Thoughts of a nice meal, some beer and our hammock began flooding my mind, and I was excited to camp! It would be our first time camping in 2014. 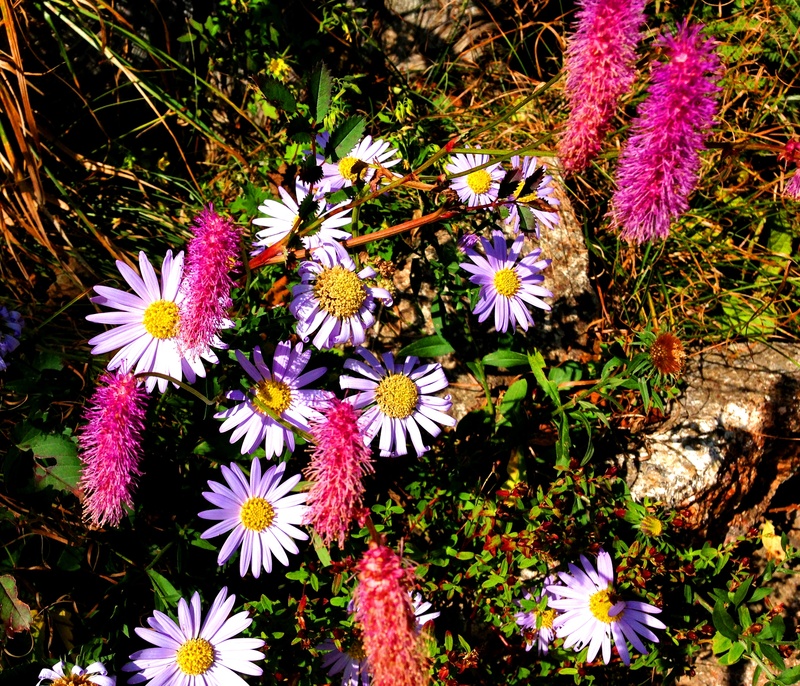 Camping and hiking sure go hand-in-hand… don’t they? The sun was still fairly high. We were on the summit around 3:00pm and made our way back to the car around 5:00pm. 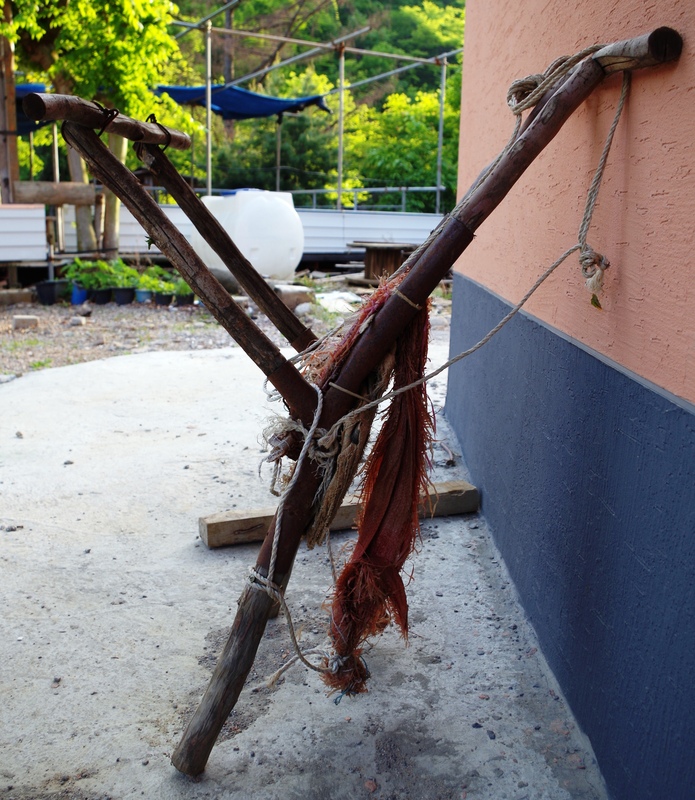 Near the trail-head, I saw this contraption. I see locals using to haul things around the farms in Korea. I don’t think porters use them to take supplies up to the shelters (bringing down trash) but I could be wrong…. They’re pretty cool though, I want one. Overall, this was a nice trail that wasn’t too strenuous nor time-consuming. I liked following the river for a while, and I also really enjoyed the blossoming trees that lined the trails. 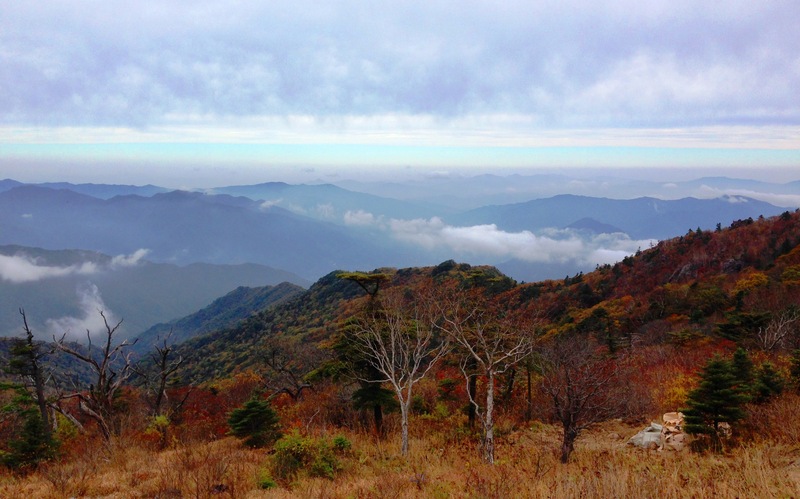 Jirisan is such a huge park with many peaks along the ridge. Next, I’m really intrigued about hiking along the entire ridge. It’s roughly 40km and goes up-down-up-down-up along the peaks. I’d love to make some plans to do the whole thing in a long weekend! Jirisan is amazing and I know we need to spend even more time here. 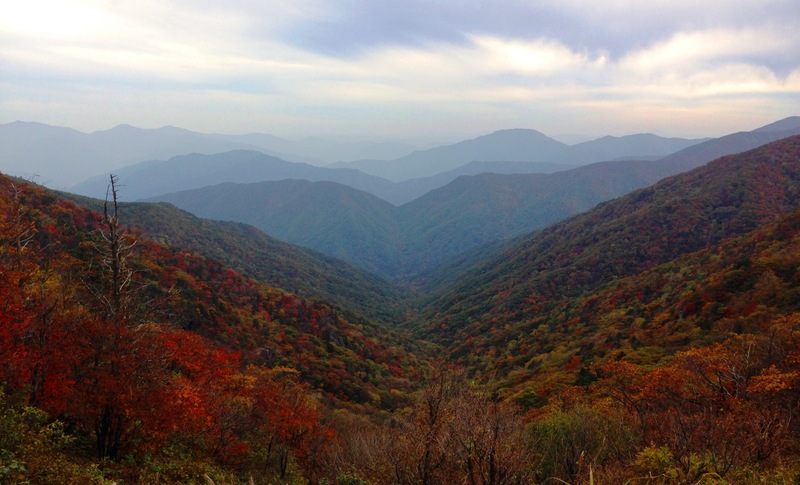 After two visits now to Jirisan, I’m just thinking about (and planning) the third. I guess really good parks will do that to ya. 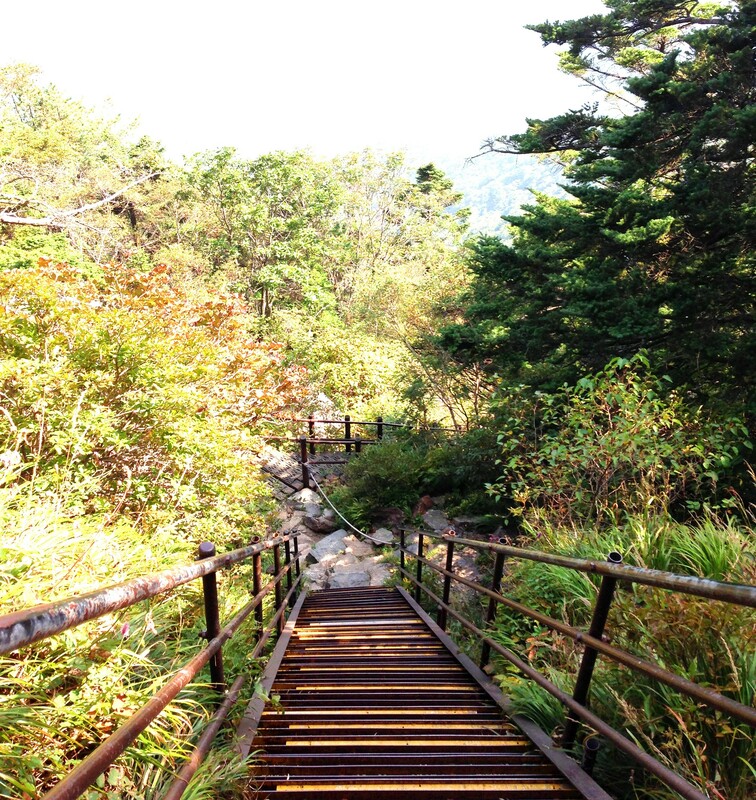 What: Jirisan National Park is famous because it’s the largest mountainous national park in Korea. It’s huge. Furthermore, it has several of the highest peaks in ‘mainland’ South Korea, but the highest is owned by Hallasan National Park on Jeju Island where Elicia and I visited in June during a four-day weekend. 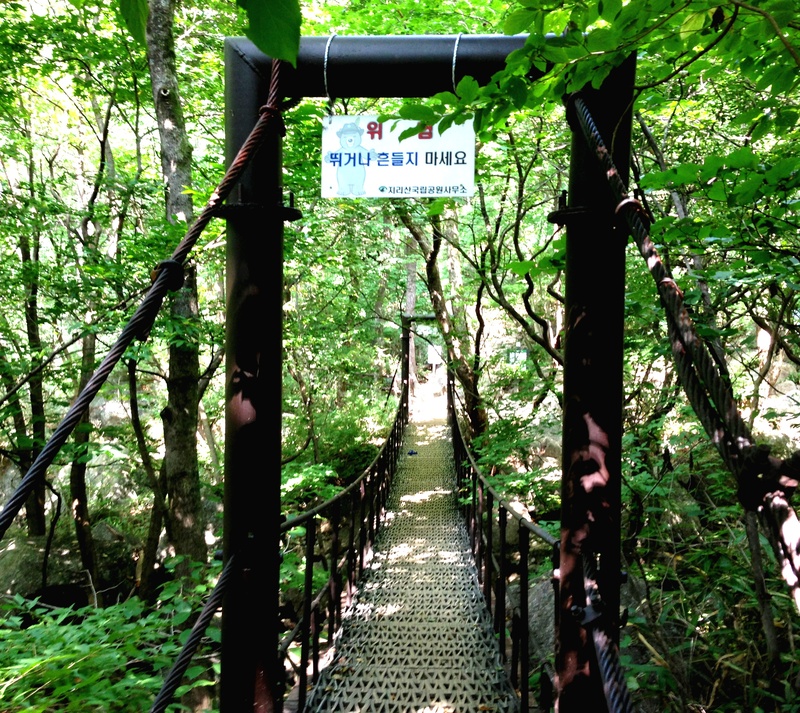 The way Koreans and expats talk about Jirisan Park, I got the sense it was the “grandaddy of them all”, meaning, it was for some pretty serious hikers and it’d be packed with beautiful scenery. This time, we were fortunate to have a five-day weekend because Chuseok, or Korean’s equivalent to Thanksgiving, was from September 18-22. 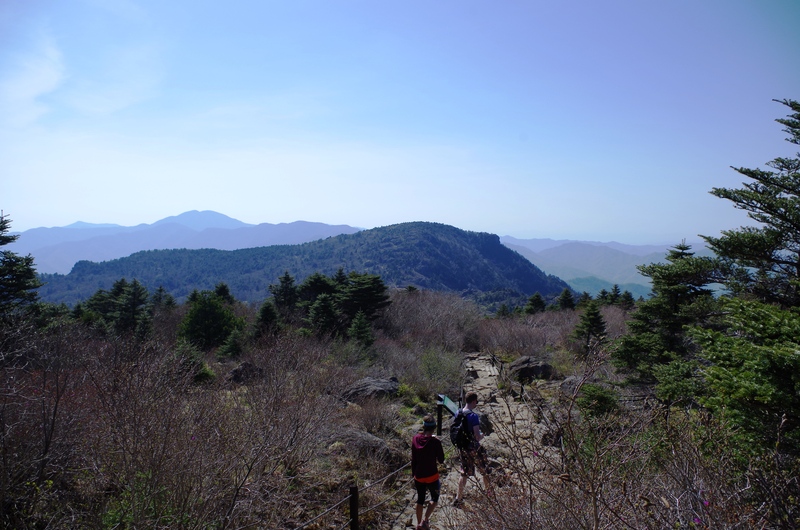 We took advantage of the time away from school, the beautiful weather, and our desire to hike the 2nd tallest peak in all of Korea, Cheongwangbong Peak, which is located in Jirisan. 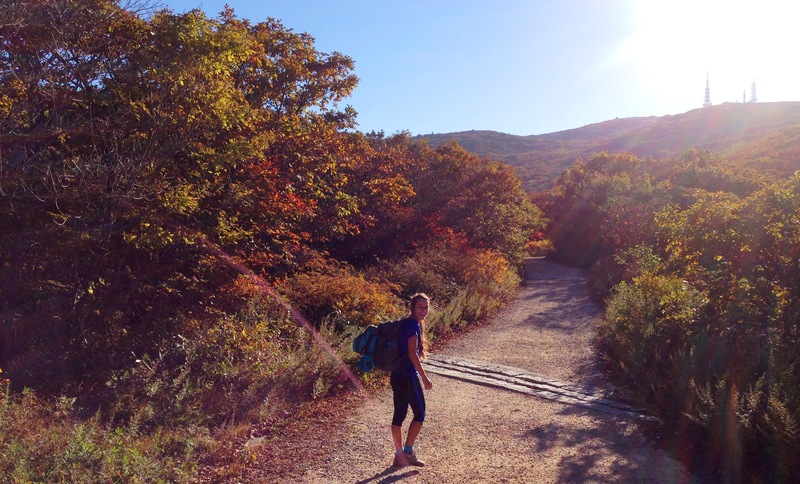 We’d throw our tent, sleeping bags, camping food and hiking food, plenty of water, and hiking gear into our car and take a beautiful two hour drive from Yeosu to Jirisan National Park, positioning ourselves at the trailhead that would take us to the top. Where: Jirisan is an hour or two north of Yeosu, depending on if you’re on the expressway or back-country roads like we took. I felt like a scenic drive. Windows down. Sunglasses on. Radio quiet. It was lovely! We arrived at our destrination, Jungsangri, at 9:30am on Wednesday morning. 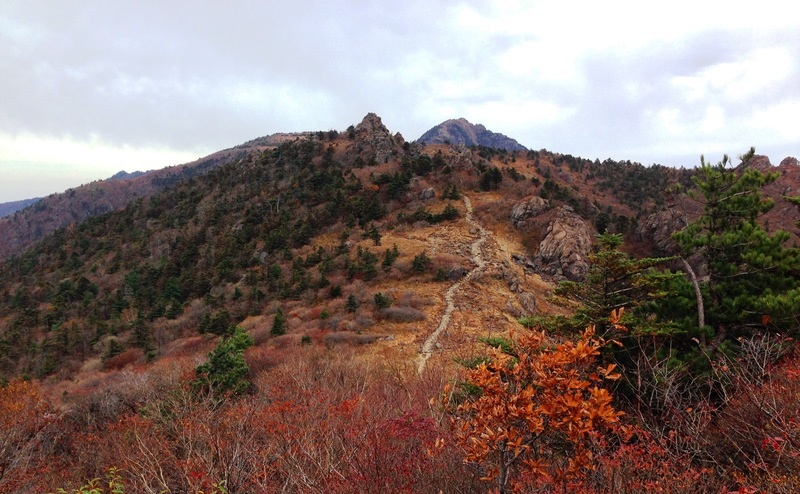 Jungsangri is one of the seven total points you may access Jirisan trails from, and this is the most direct route to the highest peak. We knew there’d be camping available at this site, so we paid our $5 for parking and $4 total for camping, set up our tent, got our backpack ready, etc. 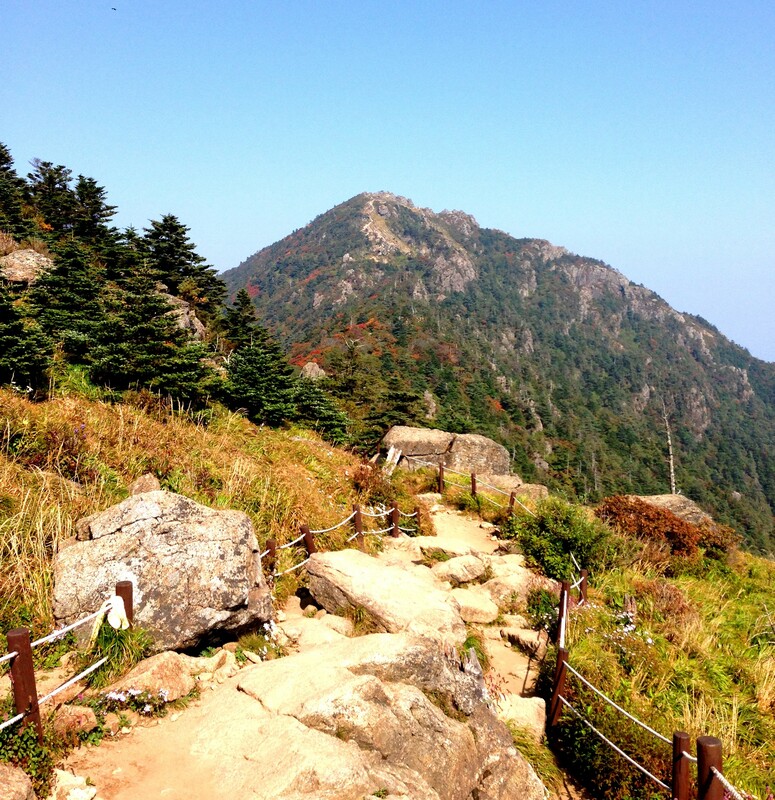 and by 10:30am we were on the trail headed towards Korea’s second highest summit. I still can’t get over the incredibly cheap camping prices here in Korea! The park HQ at this location (Junsangri) was pretty neat. This is were we paid for camping and found some trail maps, along with information about the park’s history and rich biodiversity. 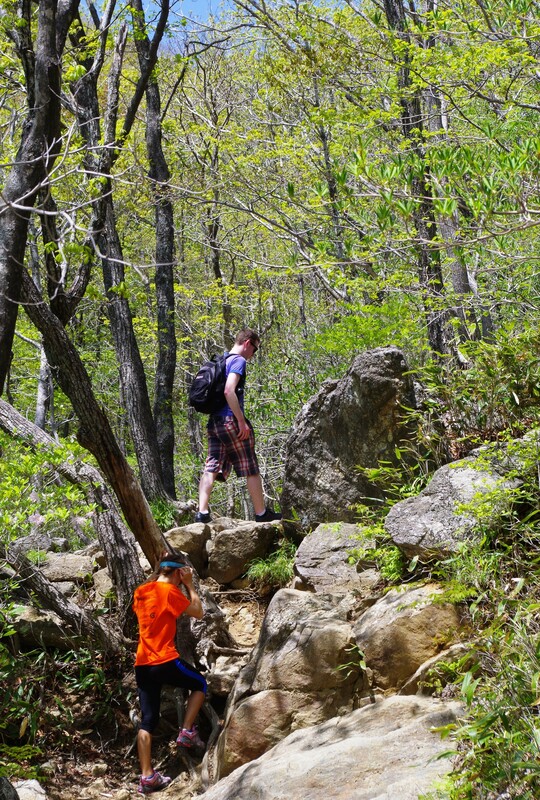 Hiking Highlights: Just like all the other trails here in Korea, there’s not too many flat spots. This trail was no exception to the norm. We scaled large boulders, climbed many steps, and winded our way up and up the mountain side. Much of it was covered by trees, provided good shade from the otherwise intense sunglight (and moderate heat). We had ham sammies packed along with plenty of fruit and water to keep us going. We followed this handy trail map. 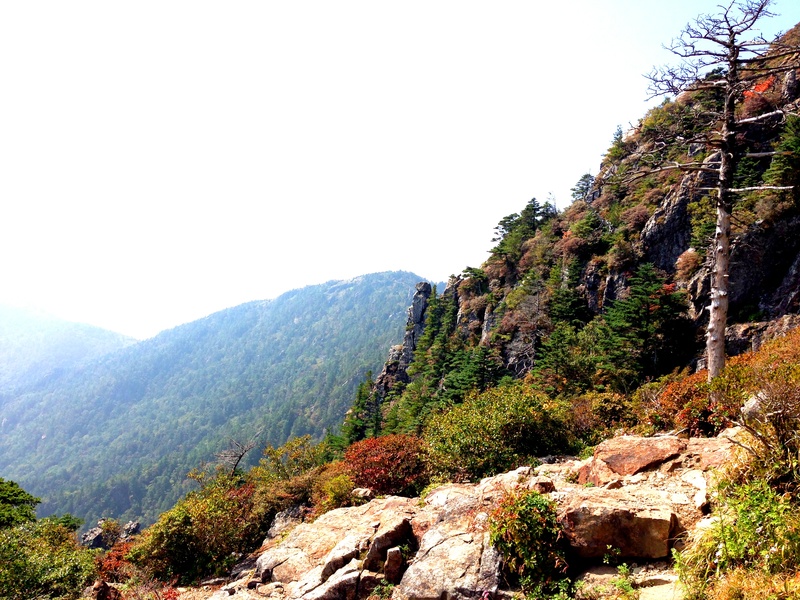 We started at Jungsanri (misspelled on the map), went to Kalbawi Rock (pictured above), to the Rotari Shelter and Beopgyesa Temple, up to the Cheongwangbong Peak. Total it’s 5.4km from bottom to top. We carried on, and found these points of interest along the way towards the peak. It surprised me to see some leaves changing colors already! Time has really flown by. It’s hard to believe it was the middle of Septmber already! The Summit: We were on the summit by 2:00pm and hung out there, basking in the sunlight for probably 30 minutes. There were a handful of other Korean hikers, but I am sure a lot less than the normal traffic (because most Koreans were with their families for the Chuseok Holiday). Other Hiking Highlights: Elicia was up for extending our hike a little bit (despite her not feeling the best) to avoid an out-and-back hike on the same trail. I love seeing as many different trails as possible, so we scooted over to the Jangteomok Shelter first (1.7Km) instead of going straight back down. BEST DECISION EVER! The way to the shelter was downhill a bit, and along a ridge, which provded great scenery. 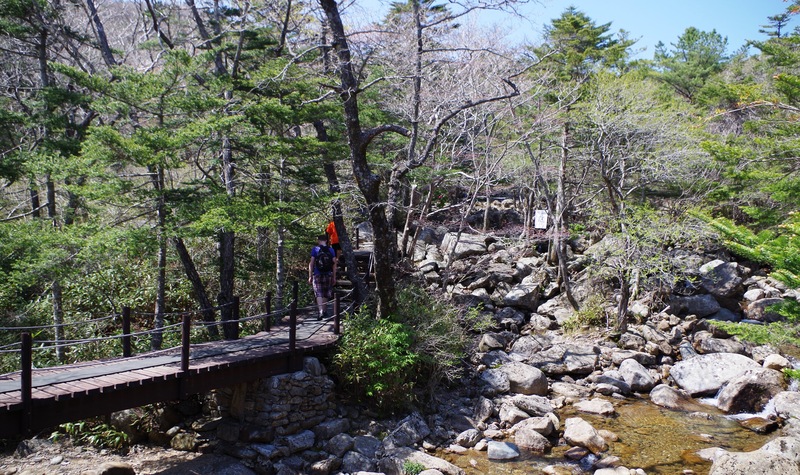 Soon we found ourselves on a trail following a freshwater river, originating in Jirisan. It was gorgeous, peaceful, and yet powerful. There wasn’t a ton of water flowing, so instead of raging white rapids, we saw the huge boulders. 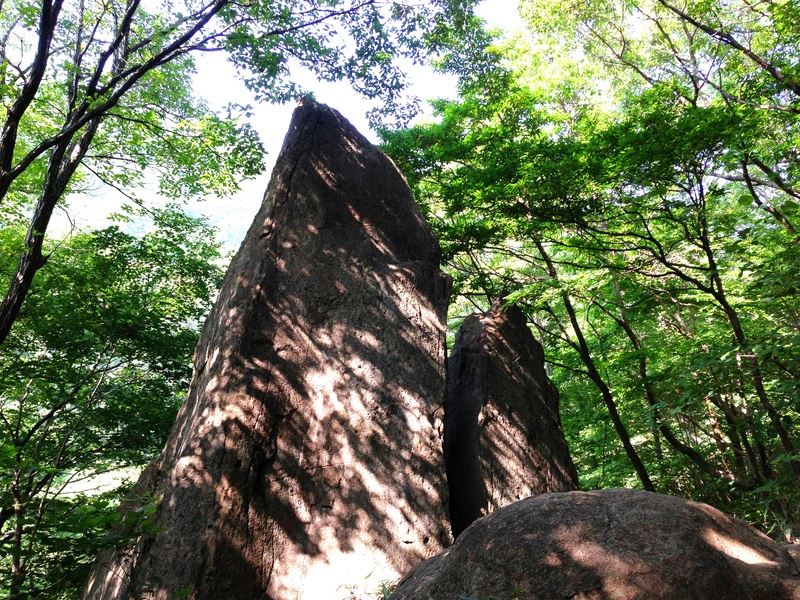 Everywhere we’ve been in Korea, we see these little rock formations. Apparently they are prayers of people as they pass by. This particular area was near Yuampokpo Falls on our way back down to the campsite for the evening. Overall: Jirisan was excellent! I’d love to go back some day and explore more. The park is really big. It’s quite intimidating, actually. 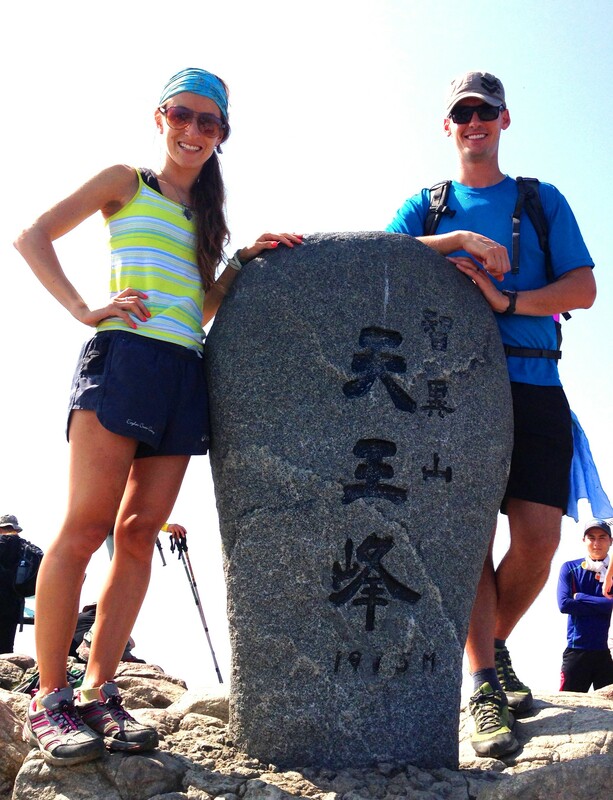 Our good friends Alyssa and Patrick did an epic 3-day hike along the massive ridge in Jirisan, and they loved it. The shelters are available to spend the night (camping anywhere but the campsites is not permited). Perhaps the next time Elicia and I have a few days off, we may take the plunge and go for it. 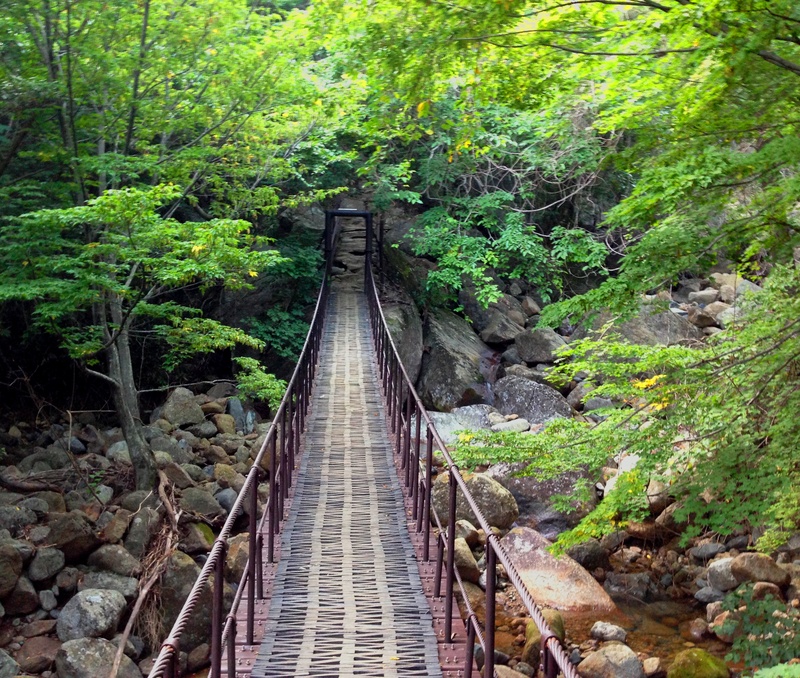 Everyone that has done it has said it’s the best hike in Korea, hands down. 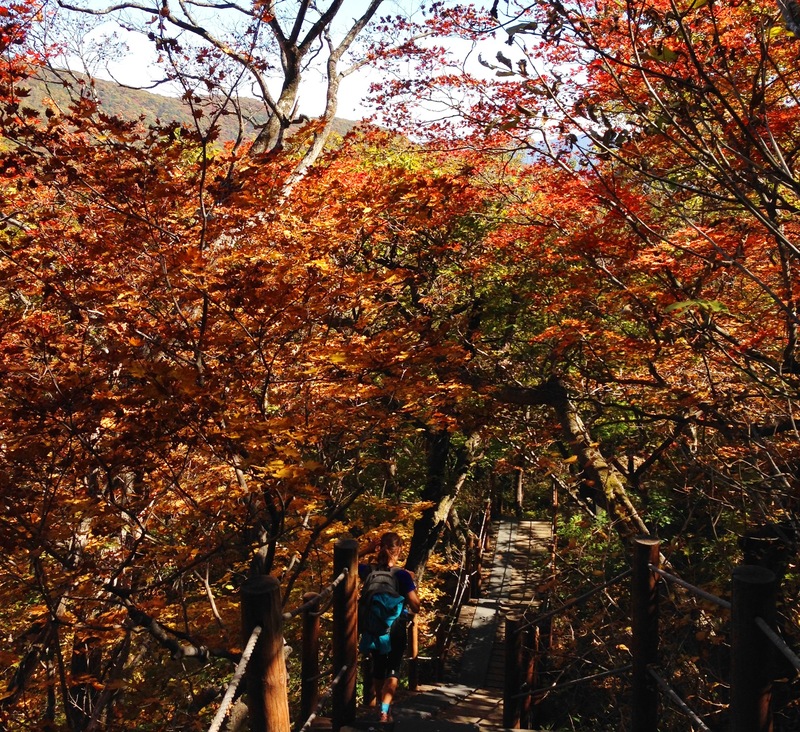 As you can see in our pictures from this 12.4km hike over Chuseok, we got a taste of what Jirisan National Park has to offer. We will be back to explore more someday soon! 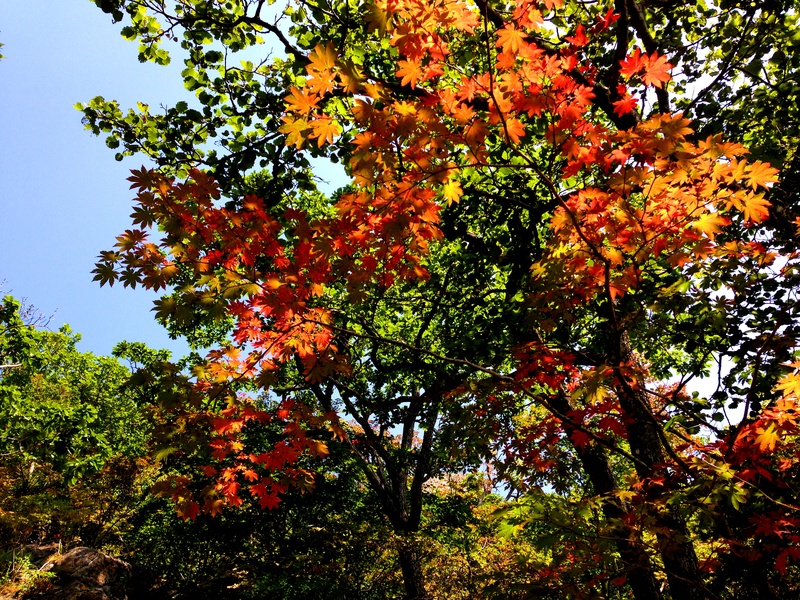 Within a few weeks, all the leaves will be changing and I think this park will become extremely beautiful. 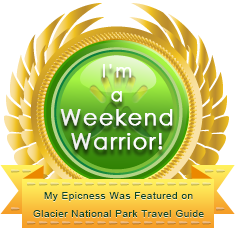 Klimbing Korean Mountains has been featured as a Weekend Warrior on Glacier National Park Travel Guide! Check out my wife’s blog, too!